Inspiration Point – a Better Valley View? As I wrote earlier, I was in Yosemite Valley yesterday to do photography. I decided to finally do the hike up to Inspiration Point for sunset, foregoing the busy “scene” at the Wawona Tunnel View. This trail starts across the road from the more famous viewpoint and climbs 1.3 miles to the original road bed that was used before the tunnel was constructed. A short distance to the right of this junction and a bit down the hill is a stupendous overlook that is at least as wonderful as the Wawona Tunnel View. Better yet, I was able to enjoy a Yosemite Valley sunset alone (with only a deer or two for company) and in silence – quite a rare opportunity these days. 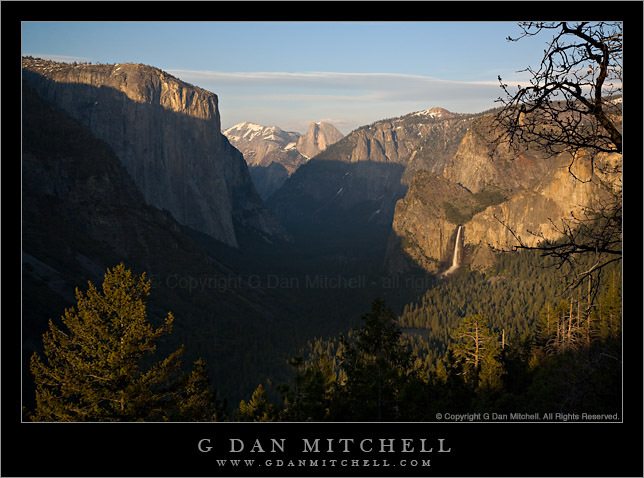 Inspiration Point – Yosemite Valley. Yosemite National Park, California. April 27, 2008. © Copyright G Dan Mitchell – all rights reserved.